Today's parenting advice is all about attachment and bonding and helicoptering your children. The need to protect them from every scrape and mishap that they may encounter in life's hurly burly. Everyone seems to want to wrap their child in a soft cuddly blanket and ferry them around in the back of their big SUV car with climate control. My parenting style was a little different to that. When I grew up, kids were pretty much left to their own devices. We roamed the neighbourhood, made up games, fell over, got cuts and bruises and pretty much looked after ourselves. I don't remember my mother hovering in the background making sure no misadventures befell her children. She was not in the slightest bit sympathetic when there was an injury and we usually put on our own bandaids. By the time I had children I thought it would be good for them to have some boundaries because the world wasn't quite as safe as it used to be. I didn't want to ignore them and let them raise themselves, but I still wanted them to have the freedom they needed to find their feet and have confidence in their decision making and their ability to define themselves as people in their own right - not glued to our sides too scared to step away. When we had our first baby I'd look at the children in the neighbourhood playing cricket on the road because their backyards were too small and I felt a bit sad. We decided to move to a couple of acres in the country so that our kids could roam free and climb trees and make cubbies and have some good old fashioned fun. I didn't feel the need to be out there climbing the trees with them, or checking for snakes or spiders, I didn't lurk in the background ready to save them if they got in a fix. Instead, we were always nearby - close enough if there was a disaster, but not helicoptering over the top of them, stifling their spirit of adventure. Children today miss so many of the benefits of detachment parenting. They cling to their parents and are often too timid to test their limits because they haven't been given the opportunity early on. They second guess themselves and often won't try something new for fear of failure. Failing is part of learning, coming last in a running race is part of life, trying again, getting back up, finding your feet, knowing your weaknesses - these are all part of the big picture for children whose parents don't hover. Looking at my children as adults, I am so glad we didn't make life too easy for them. They are managing so well as independent adults. They knew how to look after themselves when they left home and went on from there to forge really strong lives for themselves. They weren't afraid to leave the nest - they were eager to stretch their wings and expand their world. Often young people are still living at home in their late 20's - they've stopped and started university courses, dabbled a bit here and there, and ended up still sleeping in their childhood bedroom while their mum does their laundry and cooks their meals. Some mothers may love the idea of having an adult child to look after - I'm not one of them. Our aim was to produce independent, capable adults who could fend for themselves without fear of the big wide world. Who wouldn't want that for their children? If you don't start early and give them some freedom then when will they develop these skills? If you do it all for them and don't let them try their wings (in case they fall) how do they learn to fly by themselves? Modern parenting in the world we live in today has many scary aspects to it that we were lucky enough to avoid, but I look at a lot of children wrapped so tight in their mothers' apron strings and I wonder what their future holds. How will they successfully separate themselves without their mothers falling in a heap or without the need to return home all the time to be molly coddled? Give me strong, independent, well rounded children any day! Knowing they are doing well makes the empty nest a lot easier to bear. You are blessed to have adult children who are doing so well. Thanks for sharing with #overthemoon , Leanne! What we did with our kids is now called "free-range" parenting. A couple in Maryland (US) had their children put in protective services for a few hours because they let their children (10 & 6) play at the park by themselves. While they're purposely trying to create independence in their children, our systems are designed to prevent it. 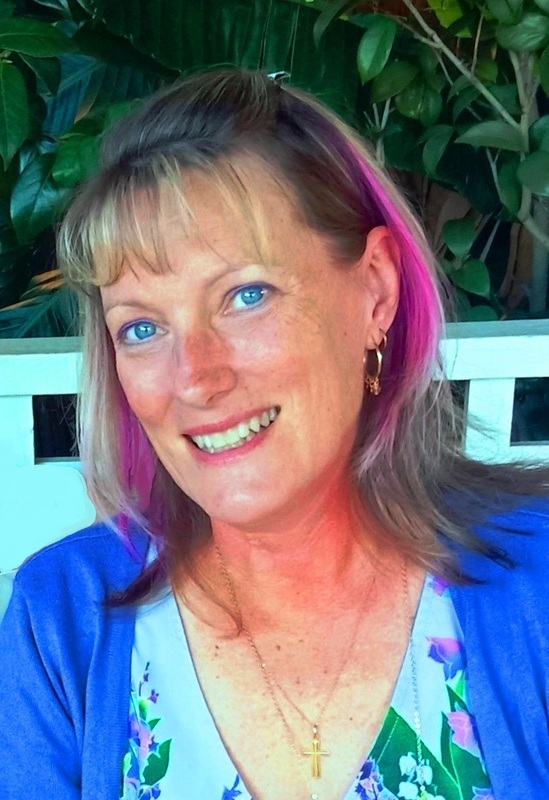 Our system seems to work on fear and trying to prevent anything going wrong before it happens Jennifer - the trouble is that it stifles us and it stops our children gaining really important skills. It's a shame. This is soooo fantastic. Im a big fan of the book Blessings of a Skinned Knee this very reason. Each day I wake and think: how can I get this child to need me less. It's how good parents should be Carla - it's a bit late to start asking that question when they're 30! Your style of parenting is wise, I think. But in today's world it is way too rare. Wayyy too rare. I worry about the future for these kids. So do I Carol - they have so much to learn much later and I'm not sure if some of them will ever get to the stage where they don't need to run home when the going gets tough. I concur in entirety. My motto was always give them a little rope- not so much that they could hang themselves but enough to get tangled up and have to figure out how to solve the problem. Maybe I was wrong but my kids have grown-up to be amazing adults. We're lucky momma's! We are indeed Cheryl - I think that rope analogy is perfect - you don't want to drown them, but they need to learn how to swim without you always holding them up. Amen! I wonder about not only the kids but the parents, especially the Mothers. What is their identity beyond their children? What can they talk about besides their children or child rearing? There really is a balance and achieving this balance does not mean being a bad Mother! Exactly Haralee! There is nothing more boring than a mother who has nothing else to talk about than her children - and how empty is her nest when they go?! 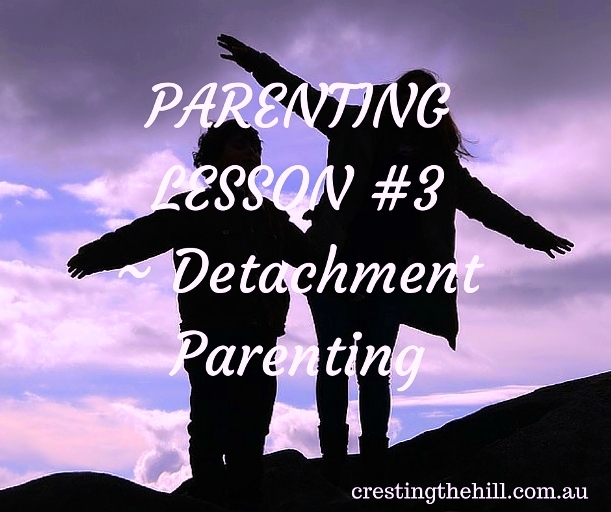 I think detachment parenting is certainly better than being a hovering helicopter! me too Tam - hovering would be exhausting and you'd lose yourself in the process. I think our generation had it easier in the parenting department. Our kids are 34 and 36 now. Back in the day, we didn't have to worry as much about our kids. For example, our kids walked to the school bus. When they were at school I felt they were safe. it would never occurred to me that they could be tragically shot at school. There were no iPhones - I knew who their friends were. With social media Etc....there are so many issues causing parents to be way more protective and concerned. That's what's so sad about our world isn't it Ellen? The trouble is that bad things still happen so it's a matter of keeping our kids safe but not having them so contained and sheltered that they can't cope when they need to leave the family home. I know what you mean Leanne. Do you know that many children's team sports don't even score so that neither side wins or loses? How ridiculous in a world where not everyone can be the best all the time! I'm going through grandparenting and I must admit it is hard not to 'helicopter' my grandson because although he is my flesh and blood he is in my care one day per week. However, I resist the urge and just love watching him explore. Unfortunately, children today are wrapped in cotton wool, given everything they ask for and are praised for every little thing they do. I fear for them as adults when there is no one to build them up or care for them. I do too Sue - I think we've created a generation that are always going to look for someone to blame rather than how to solve their own problems. You can only run home to Mum for so long before the time comes to stand on your own two feet - they need to be prepared for that day. I am so with you. 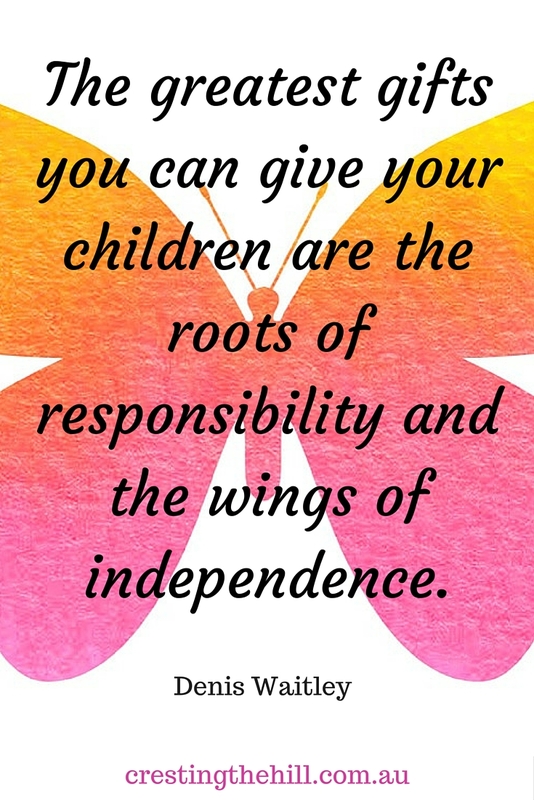 We have also encouraged our kids to be independent and make their own mistakes and learn from them. We don't do children any favors by enabling them. I couldn't agree more Lois - enabling dependence is probably one of the most subversive ways to undermine your kids as adults. My kids learned from an early age to be independent and I'm thrilled with how they turned out. Also---we had a yard such as the one you described. Ours had a fence, plus it was large and I could just open the door to let the kids play on their own. I think it was a good experience for them. Freedom to run around and build cubbies or climb trees, or make up games is so important for kids - it extends their boundaries and starts them feeling like they have the ability to do their own thing - who wouldn't want that for their kids? I'm not a parent but I do think parents these days are either over-involved or totally disconnected from their children. Very few follow the middle path. Yes Corinne, they either farm them out to child care centres or hover incessantly in the background - there is a lot to be said for finding that middle ground. Wonderful advice Leanne. I didn't knew about detachment parenting and helicopter parenting til i read this post. I too want to grow my kids independent and responsible. Thanks Mahathi - Maybe it's a Western cultural thing where parents feel like they have to watch their kids constantly and live their lives through them - it's not a healthy way to parent! My youngest is almost 20. I was honest and told her I'm trying not to be a "helicopter parent" and hover. I think twice before questioning her. I agree with your advice, Leanne, but I don't apply it to the grandchildren. I have been a hovering grandmother with them. It is a good thing children are born to younger people who can chill-ax more when it comes to children's antics! I think I'll probably hover over my grandbaby too Molly - when they're on loan you feel really responsible and want to give them back in one piece! I am the WORST at detachment parenting! We live in LA and my poor daughter is never without supervision. My joke is that I'll be her college dorm roommate. Wish I could let her roam around but in a city this size, no way! That's the trouble with city living isn't it Rosie - so many more potential threats and disasters. Moving to the country was a godsend in that regard for us. Mind you, watching them head to the city for uni was a struggle at times! It's a complicated issue this one, isn't it? I think in reality few people follow one style only and absolutely - most do a mix & I think that is probably for the best. The interesting thing about attachment parenting of babies and young children is that it has been very clearly shown to often lead to MORE independent adults. However, I think the key is knowing when to stop. For babies and young children, the security and stability gained from having parents that meet their every need actually doesn't lead to clinging or dependence later on, because what it does is foster a confidence that if they need something, someone will be there. Later that will allow them to be confident to do things on their own safe in the knowledge that if they really needed someone, someone would come. Conversely, the babies and young children who are left to their own devices more, left to self settle, required to fit in with adults & not the other way, often grow up to be more clingy, less independent and less confident. But, as I said, I think the key is knowing when to switch the styles. There is a lot of evidence to support benefits of early attachment methods, but if you are following that approach in order to support confident, independent children as they grow, it does of course stand to reason that you do have to back off and let them be confident, independent children as they grow! I think changes in how we live have also led to the decrease in that more free range attitude to older children that used to exist. When areas were less built up, cars were less ubiquitous & slower, & people tended to raise their kids in closer knit communities, where friends and extended family were also around looking out for kids, I think it was probably easier for people to feel confident about giving children some freedom. Now many people are quite isolated in raising their children, and life feels very busy, and people feel like they should be keeping their children close as no one else is going to be responsible if they aren't. Also, of course, we increasingly live in a society where other people & authorities will intervene & that makes people feel on edge about what they should be doing with their children in case it is frowned upon & reported. Everything you said is so true - it's knowing when to hold your child close and when to let them have some freedom. It's preparing them for independence without letting them feel insecure. And in this unsafe world it becomes even harder to get the balance right. I am so glad our children grew up in simpler times - we could let them have more freedom than I would be allowing them to have in today's scary world! 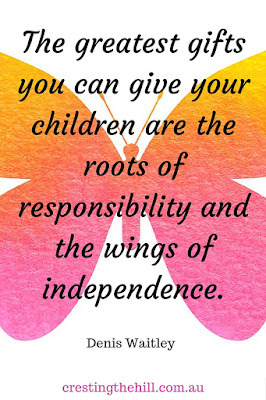 Raising independent children is an attitude to parenting that is not dependent on the physical circumstances. City living has its challenges likewise even country towns are not the innocent safe places that they used to be. Giving young children appropriate responsibilities and giving recognition to achievements along the way. Learning that they are not always going to win and be the best, but to aim at being the best that they can be. Competition is healthy. Congratulating those who did better, is healthy. Knowing when to step in and help and when to stand back will change with each stage the child is at. Have an overall attitude throughout the child's life to encourage the ability to be independent and not be emotionally tied to the apron strings. Someone said, It is not what I do for my children, but what they learn to do for themselves, that will make them successful adults. I completely agree Kathleen - it's about wisdom as a parent - knowing when it's safe to let your children have space to themselves, and teaching them to recognize danger and avoid it. We can't hover over our children forever, we need to build strength into them so we don't have them clinging to our sides long after they should be making their own way in the world. We have always had the blessing of a big enough yard for our children to play freely and Close enough to a Park fro them to roam and fly if they wish. 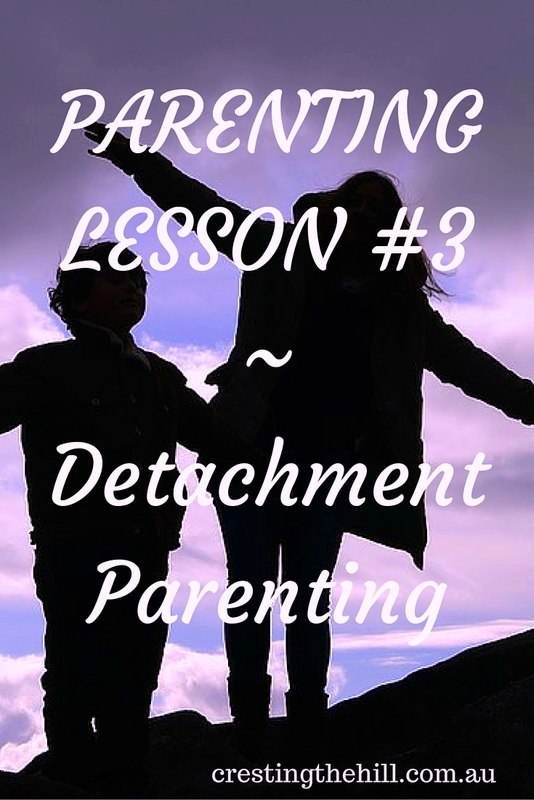 I dont believe in Helicopter parenting and I am so glad you shared this post about detachment but not abandoning. Thanks for sharing at the Pit stop!